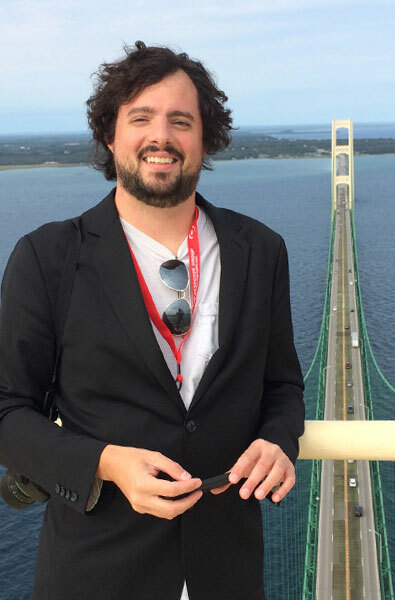 Reporter Garret Ellison atop the Mackinac BridgeMLive environmental reporter Garret Ellison, a 2006 NMC graduate, has been named the 2017 Michigan Journalist of the Year by the Michigan Press Association. Ellison, 35, was cited for his “watchdog work” on issues of water use and Great Lakes protection, which reaches a reported online audience of 11 million readers a month. MLive also feeds seven Michigan newspapers. He says he found his career calling at NMC, after he started publishing photos in the White Pine Press. His writing was “good enough” but it was the timing that was perfect for the 2001 Traverse City West High School graduate, who found himself in the editor’s role when the rest of the staff graduated and longtime faculty advisers retired. “We decided to redesign it and re-imagine some of the coverage scope,” Ellison said of himself and then new adviser Kim Schneider. He still uses those lessons, particularly the instinct to follow his own initiative, on the environmental beat, where he transitioned from business in 2014. It made sense for him to try since he was based in Grand Rapids, MLive’s biggest city. The condition of Enbridge’s Line 5 pipeline under the Straits of Mackinac was becoming a bigger issue, so Ellison started paying attention to that. At an editor’s suggestion, he started looking into Nestle’s groundwater withdrawals in northern Michigan. Then came legacy contamination, Superfund sites and more. Ellison imparts that message to his own students, too. In addition to his daily reporting for MLive, Ellison is now an adjunct journalism instructor at Grand Valley State University. “It’s a little weird. I’m not so far removed from being on the other side of the coin there,” said Ellison, who went on to Central Michigan University after NMC. “I really feel a lot of value in the community college experience, and I’m grateful the institution was there for me,” he said.